The Fed has cut rates 8 times since September 2007. NEW YORK (CNNMoney.com) -- The Federal Reserve, working in coordination with other central banks worldwide, enacted an emergency interest rate cut on Wednesday. "It tells a lot about the weakness globally," said Lakshman Achuthan, managing director of the Economic Cycle Research Institute. "We have a global recession now. It's not simply a U.S. recession. This is what's weighing on the impact of all of these bailouts." Earlier in the week, the Fed took steps that could potentially make trillions of dollars available to banks and the nation's leading businesses. That's on top of the controversial $700 billion Wall Street bailout approved by Congress last week. In addition, the Bank of England on Wednesday announced a plan to bail out that nation's banks, saying it would make at least $350 billion available. U.S. stocks opened sharply lower but quickly turned positive before falling back into negative territory in late morning trading in New York. In a five-day losing streak for U.S. stocks heading into Wednesday, the Dow Jones industrial average has plunged more than 1,400 points. 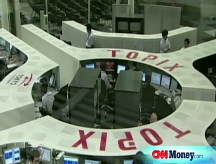 Stocks in Japan closed down nearly 10%, their worst drop since the crash of 1987 and their third worst day in history. European markets were down early - even with the British bailout - rebounded on the rate cut news and then fell into negative territory. European markets were all down about 5% or more in late afternoon trading. The Fed on Wednesday also reduced its discount rate, the level at which it lends money directly to banks and Wall Street firms, by half of a percentage point to 1.75%. But the fed funds rate is the central bank's main tool to affect the economy. Lowering the rate pumps money into the economy by reducing the borrowing cost on a broad range of loans, including credit cards, home equity lines and many business loans. The moves were made in coordination with other central banks around the world including the European Central Bank and Bank of England. The ECB, which had kept rates unchanged as the Fed engaged in a string of rate cuts over the last year, cut its rate by a half-point to 3.75% - its first cut in five years. The Bank of England also cut its rate by a half-point to 4.5%. The Swiss, Canadian and Swedish central banks also made cuts. The Bank of Japan joined the statement of the other six banks expressing its strong support of these policy actions. But with its rate already at 0.5% before the joint cut, it did not follow with a cut of its own. The People's Bank of China did not join the other central banks in the joint statement. But it announced that its benchmark one-year lending rate had been cut by 0.27 percentage points to 7.2%. Central banks have followed each other in coordinated cuts in the past. For example, the ECB and the Fed both made emergency cuts a week after the Sept. 11, 2001, terrorist attacks. But the joint statement announcing a cut at multiple banks is still rare. Wednesday's cut was the Fed's eighth since September 2007 and the second outside of a regularly-scheduled meeting. But the Fed had left rates unchanged at its last three meetings ahead of this emergency cut. 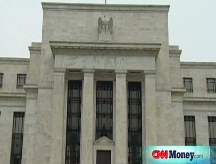 The Fed's next monetary policy meeting is a two-day session that concludes on Oct. 29. The cut follows a Fed announcement on Tuesday that for the first time it will start to loan money directly to the nation's major businesses by buying their commercial paper, a form of lending that is considered crucial to the operations of many large and mid-size companies as well as most leading financial institutions. There is $1.8 trillion in commercial paper outstanding. The Fed said there was no limit on the amount it was willing to purchase. On Monday, the Fed dramatically increased the size of its term auction facility, a way to loan money to the nation's central banks. It said it would immediately double the amount of funds it was loaning out in that program to $300 billion, and signaled it could be loaning out $900 billion by the end of the year. Fed Chairman Ben Bernanke and Treasury Secretary Henry Paulson were also the main advocates of a controversial plan for Treasury to buy $700 billion in damaged mortgage-backed securities in a bailout of banks and Wall Street firms who have seen their profits and balance sheets hit by declines in those assets. The decline in home prices, and the resulting record levels of home foreclosures, caused the value of the assets to plunge in the last year. The House approved an updated version of the bill on Friday after rejecting an earlier version last Monday. In a speech Tuesday, Bernanke warned that the global financial markets crisis is likely to restrain the economy well into next year and said it appeared the threat of inflation was retreating. Central banks can be reluctant to cut rates because it can feed inflation pressures. "Overall, the combination of the incoming data and recent financial developments suggests that the outlook for economic growth has worsened and that the downside risks to growth have increased," he said in a speech to the National Association of Business Economics. The speech signaled that a rate cut was coming. "In light of these developments, the Federal Reserve will need to consider whether the current stance of policy remains appropriate," Bernanke said. The Fed's statement on Wednesday said the decline in energy and other commodity prices and the weaker prospects for economic activity have reduced the upside risks to inflation. Even Dallas Fed President Richard Fisher, a so-called inflation hawk who has worried about inflation pressure, voted in favor of this cut. Fisher had voted no on several previous cuts, advocating smaller cuts than the Fed was making at the time, and had voted for a rate hike at two of the meetings at which it left rates unchanged. It is possible that the Fed could go ahead ahead and cut rates again at its regularly scheduled meeting on Oct. 29. Some had called for the Fed to cut rates by as much as a full percentage point, and the Fed has cut rates again at its regular meeting after its previous three emergency rate cuts - in January 2008 and in January and September 2001.